The cleansing of the eye contour area is often approached through specific products, taking into account both the particularity of this area characterized by increased sensitivity, and that of the products, particularly those resistant to water. There are general products that often come in the form of"cleansing milks" or lotions. These are fine emulsions, more or less liquid, formulated around the notion of conventional make-up removers in which the mode of action is essentially the dissolution or dilution of make-up. This dissolution is obtained by the use of fluid hydrocarbons (petroleum jelly or paraffin oil, or fluid isoparraffins) in limited proportions to avoid the formation of a greasy veil during use. These oils are optionally supplemented, or even substituted, by fatty acid esters with good solvent properties: isopropilic esters or alkyl benzoates. These formulas are often added with a surfactant or mild detergent to complete the solvent action by wetting. Finally, the pH is adjusted to the neutrality to respect that of the tear fluid. - AQUA - ISOPROPYL PALMITATE - PARAFFINUM LIQUIDUM - GLYCERIN - BUTYROSPERMUM PARKII BUTTER - METHYLPROPANEDIOL - CETYL ALCOHOL - VITIS VINIFERA SEED OIL -PANTHENOL - GLYCERYL GLUCOSIDE - SODIUM PALMITATE - GLYCERYL STEARATE - SODIUM STEARATE - SODIUM CARBOMER -SODIUM MYRISTATE - SODIUM ARACHIDATE -SODIUM OLEATE- ETHYLHEXYLGLYCERIN -PHENOXYETHANOL. 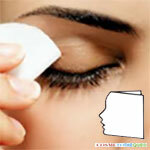 Eye contour make-up remover lotions, including non-waterproof mascaras, are formulated on the basis of aqueous surfactant solutions generally chosen from the so-called"mild" detergent class, whose pH is adjusted to that of the neutral lacrimal liquid, and whose isotonicity to tears is reached by the use of sodium chloride. Classically, there are two types of formulation, classic lotions and micellar lotions (term describing diluted aqueous solutions of surfactants in which the latter spontaneously form micelles). The use of highly hydrophobic mascara, called waterproof, has led for many years to the marketing of special make-up removers associated with these formulas. Initially, they are oily solutions, mainly based on petroleum jelly or paraffin oils, supplemented by fatty acid esters that are not oily enough to reduce the greasy sensation when used. The use of low molecular weight isoparrafins (isodecane) or volatile silicones may also be noted. In recent years, the industry has developed a new type of product in this segment, characterised by the coexistence of two phases. These products are called two-phase make-up removers. The organic phase consists of a mixture of oils as described above, while the aqueous phase consists either of water, physiological serum (isotonic with tear fluid) or floral waters (often blue or pink). The emphasis is on ease of mixing, but also on the fact that the emulsion must be quick and, conversely, perfectly reversible and very clean. The quality of the interface is one of the difficulties linked to the formulation of these products which are much more complicated to conceive than the simple water/oil mixture, which is the paradox of these formulations. A fairly popular class of make-up remover, these products are made by impregnating textile supports, woven or not (cotton for example but not exclusively), either with oily formulations comparable to waterproof make-up remover, or with micellar lotions, or in some cases with very fluid emulsions with a composition comparable to traditional make-up remover. Other types of formulation also exist, but only represent more anecdotal cases, the principles implemented (dissolution and wetting) remaining the same.